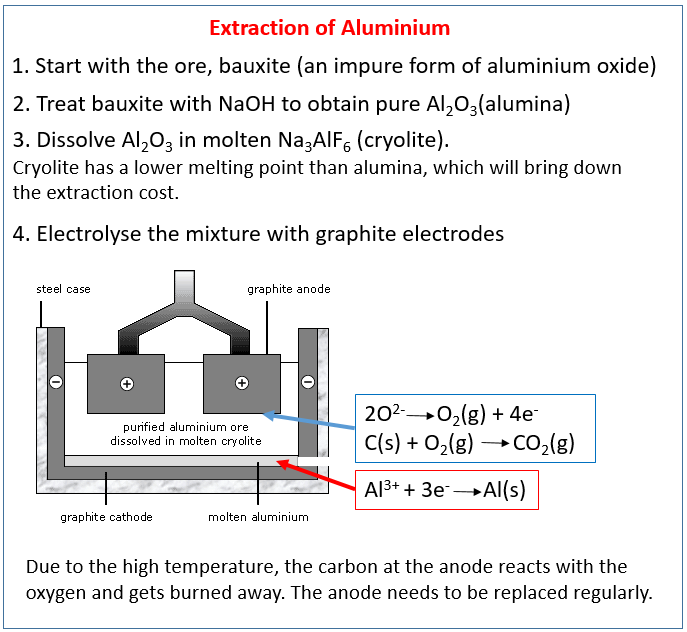 The following diagram shows how to extract aluminium from bauxite using electrolysis. Scroll down the page for more examples and explanations. How to extract alumnimium from bauxite using electrolysis? Aluminium is the most abundant metal on Earth. However, it is expensive because a lot of electricity is used to extract it. Bauxite is the aluminium ore. It is purified to yield aluminium oxide, which is a white powder. Aluminium is then extracted from aluminium oxide by electrolysis. The aluminium oxide must be made molten so that the ions can pass through it during electrolysis. Aluminium oxide has a very high melting point - over 2000 degrees celsius. So instead of trying to melt it, the aluminium oxide is dissolved in molten cryolite. Cryolite is an aluminium compound with a much lower melting point than aluminium oxide, and so using this reduces some of the costs in extracting aluminium. The steel case is coated with graphite, providing the negative cathode. The positive anodes are immersed in the molten cryolite, and are also made of graphite. When the battery is turned on and electricity flows, the aluminium forms at the negative cathode and sinks to the bottom of the tank where is is tapped off as a pure liquid metal. Oxygen forms at the positive anodes. The oxygen reacts with the carbon of the graphite, forming carbon dioxide. The positive anode therefore burns away, and needs replacing regularly. This is another reason for the extraction of aluminium being so expensive.